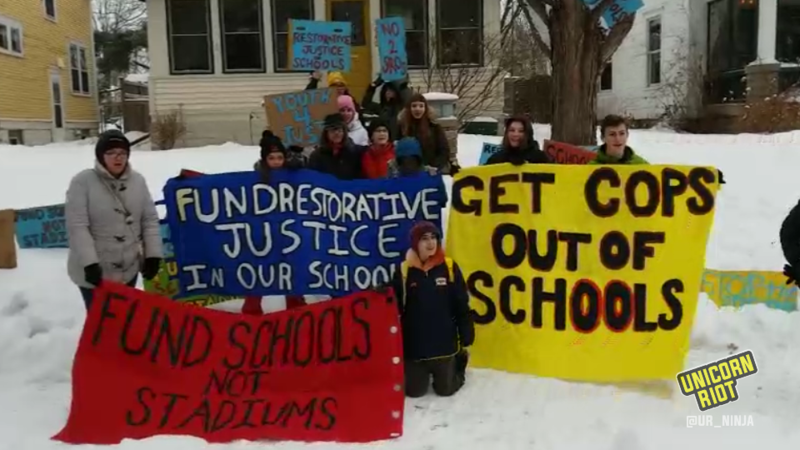 Minneapolis, MN – On the day before Super Bowl LII, youth organized and led a march to the home of the chair of the local school board with a series of demands, including an end to employing police inside of Minneapolis Public Schools. Unicorn Riot was live documenting the event. 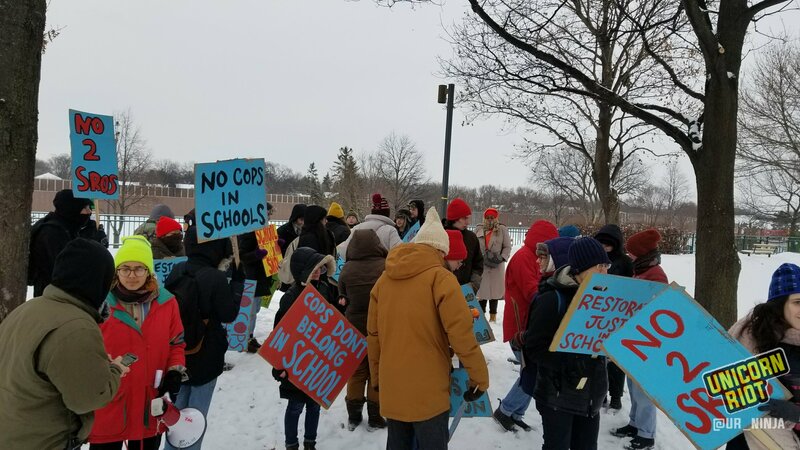 Organized by the Young Peoples Action Coalition (YPAC) who are “dedicated to organizing high school students in movements for justice“, dozens of community members gathered at Martin Luther King Park in South Minneapolis in frigid single digit temperatures on Saturday afternoon. The crowd took the streets and marched a few blocks to Minneapolis School Board chair Rebecca Gagnon’s house. They chanted along the march, yelling; “If we don’t get no justice they don’t get no peace“, “Hey hey, ho ho, SROs have got to go” and “Bow down Gagnon, we the students are the bomb! We ready, we coming” (the last being a play-off of the chant “Bow down Babylon, Black people are the bomb! We ready, we coming”). SROs are School Resource Officers, police that are stationed inside of all Minneapolis Public High Schools. SROs are dressed in police uniform and wear a holstered gun while in the school. After the march reached Gagnon’s house, they formed a semi-circle and took up the whole street. Youth representatives knocked on Gagnon’s door and rang the doorbell in attempts to present their demands to Gagnon themselves. When no one came to the door, the youth broadcasted their demands over the megaphone (see video below). Neighboring residents in the King Field neighborhood came outside to watch, while others watched through windows; one was seen clapping along with the march. The Southwest student spoke about SROs, saying “our students are not criminals“, yet “there’s this cop who just sits there, using his presence to terrorize students“. The students and community members dispersed from the area after leaving many of their signs stuck into the snow outside on the lawn of Rebecca Gagnon. One of the demands that is likely to be met is the name change of Patrick Henry High School. Patrick Henry was one of the Founding Fathers, and although he may have spoken against slavery at some point, he died with 67 slaves. The idea of sending youth in North Minneapolis to a school named after a slaveowner has been publicly debated for years, particularly after a student spotlit the issue with an article in the school paper. Name changes away from past figures representing white supremacy have happened twice in the past year in Minneapolis, that of another school and of a lake. Formerly-named Ramsey School in South Minneapolis (not far from MLK Park) was named after Alexander Ramsey, a former Minnesota Governor who called for the extermination of Native Americans. The school is now called Justice Page School, named after Alan Page, a former NFL MVP (1971) with the Minnesota Vikings and associate justice of the Minnesota Supreme Court. Just as in those name-change struggles, there is today a group of dedicated people taking the time to organize the push to change the name of Patrick Henry High School, and they are led by students. Students in Minneapolis have a history of speaking out for what they believe. In May of 2015, Unicorn Riot filmed a student walkout that met up at MLK Park in South Minneapolis. The walkout action’s demands were similar to Saturday’s action: provide alternatives to suspensions, more African-American History curriculum, and no more police officers in schools. When it comes to cops in schools, newly elected Mayor of Minneapolis Jacob Frey believes a shift in the public’s perception of the police will help ease the tensions. Youth who were out marching on Saturday voiced that they don’t feel safe around the police. 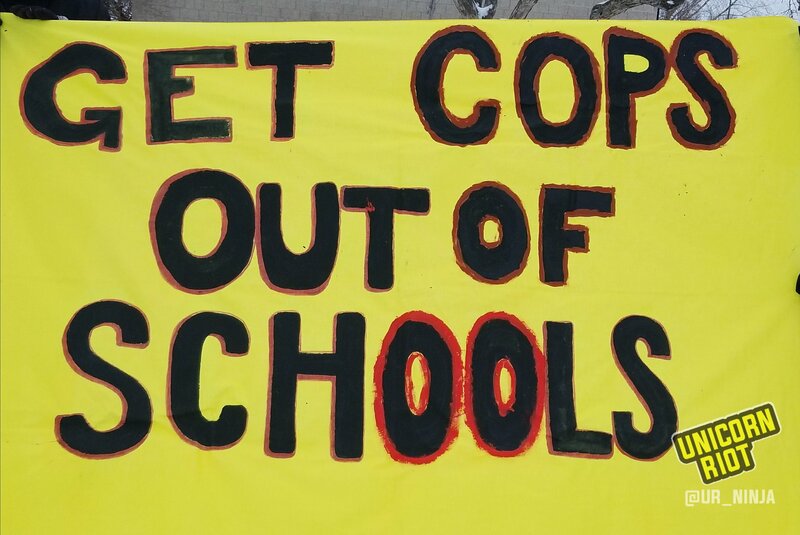 ‘Get Cops Out of School’ banner that accompanied the march. In the last few years, many organized groups such as the Black Liberation Project, Social Justice Education Movement, YPAC, and others have struggled against SROs in schools. In a gesture seen by many as a meaningless concession, Minneapolis Public Schools voted in August 2017 to reduce the number of SROs in schools from 16 to 14. We will continue to follow some of these issues in education as they continue to materialize.